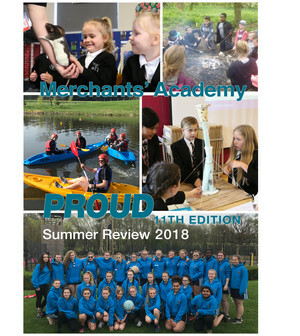 The Merchants' Academy Magazine showcasing news from term 5 and 6 is available to view online. This summer students across Primary and Secondary have experienced a number of educational workshops with Nursery enjoying a visit from Zoolab and Primary holding the first cross Trust Spelling Bee competition. At Secondary, Performing Arts students showed commitment and enthusiasm showcasing their own production of 'The Theory Of Relativity' at Bristol Old Vic and Andi Colwin joined Y10 artists to create some large scale wall art. The magazine also highlights student achievements throughout the academy, rewarding students who have displayed progression and improvement in their behaviour, attendance or academia. This edition also highlights students who have achieved 100% attendance throughout the whole of 2017-2018. We wish you all a relaxing summer break.